Shell Rotella® T5 10W-30 diesel engine oil with Triple Protection Plus™ technology uses synthetic base oils plus advanced additive technology to provide protection against wear, deposits and oil breakdown. The +'s in the table below indicate relative performance. White background appears from bottom of screen with Shell Pecten logo. Thin gray dashed line runs straight down from logo as if pulling up next graphic page from bottom of screen. Background is red then blue. Large white text, engine appears at lower right and pulses. Operating in wide temperature ranges can be challenging for your engine. Dashed line appears in center of screen running upward pulling white background down from top of screen. Red, black and gray text on screen left and Shell Rotella T5 product bottle on screen right. Triple protection plus logo appears below text. Dashed line runs from product across screen right pulling yellow background onto screen. Yellow background is pushed up and off screen by a green background. Green background is pushed up to upper third of screen to become a title bar by a gray background and green bar comes up from bottom of screen to frame gray. To offer all the hard work you expect, whatever the season. Dash line appears near text and runs to screen left pulling on a blue background with white specs floating about. Dashed line appears pulling up white background from bottom of screen. Triple protection plus logo in center of screen. White background pushes to screen left as red background fills screen right. Termostat appears screen left and text screen right. White background on left stays in place, red background is squeezed upward to reveal video in bottom right quarter of screen of engine with text across center. New gray background appears from screen right text. Wear protection is key to prolonging engine life. Which translates to engine protection. The O in the word protection morphes into a yellow key with the letter ‘o’ as the top part of key. Text appears screen right. Delivering an average of 44 percent better protection than the maximum wear allowed. Dashed lines appear from center above graph and pull down a white background with Shell Rotella T5 bottle in center. Large letters ‘w’, ‘d’, ‘e’ to build the word ‘wide’ using the product bottle as the ‘I’. Additional text is smaller underneath. Vertical gray dashed line appears below text in center. White background pushed off bottom of screen by video of five semi trucks driving toward us on road. Video pushed to second eighth of screen by a tractor..
All video pushed off screen left by a red background with font in white all caps that builds on one line at a time. Horizontal white dashed line appear screen right of text. Engine outline appears at bottom of screen. White dashed line runs from center downward pulling orange background onto the screen. Dashed line continues from top of screen and draws an open rectangle in clockwise direction around text and then off screen left to reveal yellow background. Can help you achieve your operational goals, no matter where you drive. Dashed lines appear at top of text and pulls down video of car dashboard with green filter. Large typeface for word ‘no’ medium typeface for ‘matter.’ Remaining text in small typeface. Dashed lines begins left of the word ‘matter’ and runs under text to center screen then across and pulling on white background from screen right. 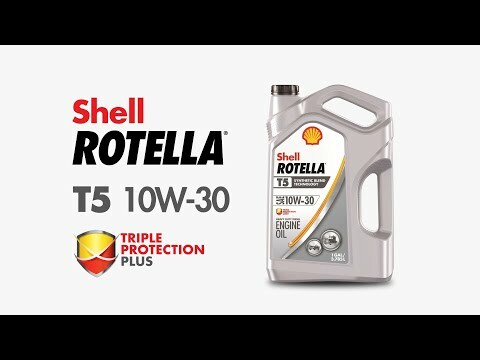 Find out if Shell Rotella T5 10W-30 Synthetic Blend Heavy Duty Engine Oil with Triple Protection Plus is the right Rotella for you. Introducing Triple Protection Plus technology. That’s why Shell scientists have developed Shell Rotella synthetic oils with Triple Protection Plus technology. This unique formulation combines Synthetic Base Oil Technology and our Adaptive Additive technology to provide outstanding engine protection that helps to lower total cost of ownership. Let us have a look into the formulation of Triple Protection Plus technology. Triple Protection Plus technology helps deliver engine protection with reduced viscosity engine oils. By utilizing reduced viscosity oils, less energy is required to pump the oil around the engine, resulting in increased fuel efficiency, lower operating costs and reduced CO2 emissions. Adaptive Additive technology, on the other hand, adapts physically and chemically when required to provide protection. This is how Triple Protection Plus technology works. Anti-wear chemistry provides extra protection against friction in high-stress areas, extending your engine’s lifespan. Detergent molecules prevent build-up of deposits around the piston crown, resulting in a cleaner, more efficient engine and reduced maintenance costs. Triple Protection Plus technology was designed to provide enhanced engine protection, long oil life, reduced fuel and maintenance costs, all temperature protection, resulting in lower total cost of ownership. 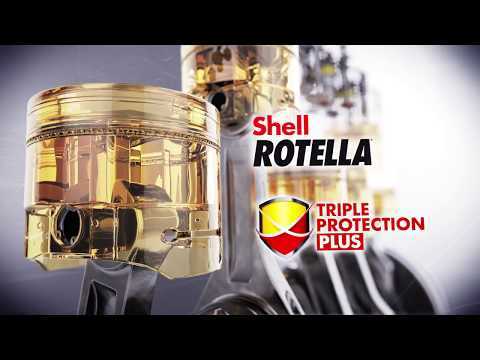 Shell Rotella with Triple Protection Plus technology, the engine oil that works as hard as you.